Place the coconut flakes on a tray and toast in oven until golden, about 5-10 minutes. Keep a close eye on them as they do toast quickly! Prepare the meringue, place egg whites in the bowl of an electric mixer fitted with a whisk attachment, whisking until soft peaks form. While whisking, gradually add sugar. When you have achieved stiff peaks and mixture is thick and glossy the mixture is ready to bake. Spread meringue thinly onto a large baking tray lined with paper and place in the oven at 95C. Bake until dry, approximately 40 minutes. Remove from oven, break into shards and set aside. For the lemon curd, place the butter and lemon juice in a saucepan and set over medium heat to warm. Meanwhile, place eggs and sugar in a bowl and whisk to combine. While whisking, slowly add hot lemon juice and butter to the eggs until all combined. Return mixture to the saucepan and set over medium heat. Cook, stirring, until mixture has thickened. Remove from heat and transfer to a cold bowl and refrigerate until cool. Transfer to piping bag. Make the whipped coconut. Remove coconut cream from fridge and turn can upside down. Open and pour off the liquid. Place remaining coconut cream into bowl along with the vanilla and half the honey, whip until smooth. Taste and add more honey if desired, keep in mind that both the syrup and the meringue are sweet. Cover bowl and place in fridge until ready to serve. Slice pineapple into 1cm chunks, char until black lines appear. Repeat on the other side. Plate Up! 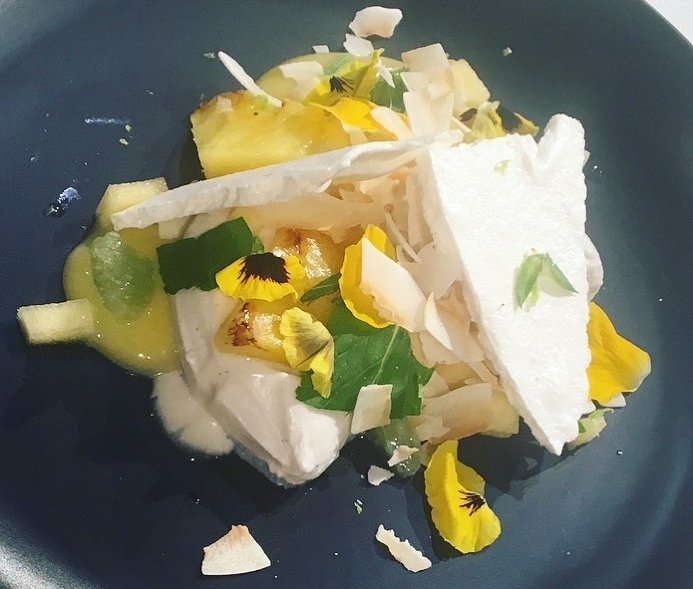 Place a large quenelle of coconut in the centre of the plate. Dot around the curn, sprinkle the toasted coconut flakes, pineapple and mint. Zest a lime over the top and finish with edible flowers. Enjoy!